What is the Road to Gold? 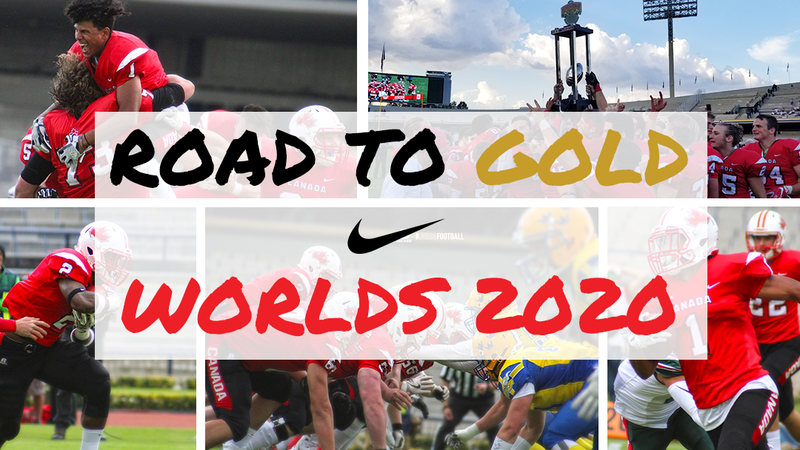 Road to gold is the selection process which will determine the composition of the 2020 Junior National Team that will represent team Canada at the IFAF World Junior Championship in the United States. All information for Road to gold can be found HERE! What is an Identification Camp? These camps will help determine players for the team that will represent the nation at the 2020 IFAF World Junior Championship, hosted by the United States. For further details on ID Camps as well as dates for when a camp will be held around you; click HERE! The identification camps are open to those athletes born in 2001 as well as 2002. Participants must be a Canadian citizens and must be a current or former member of their respective provincial football association that are in good standing with Football Canada. Those who register will also receive two months free on Volt Athletics Strength and Conditioning platform to train before the camps begin. Football Canada branded Identification camp t-shirt. Opportunity to be identified as a top 100 junior national athlete . Top 100 athletes have the chance to compete for Team Canada at the 2020 Junior World Championships. Coached by high level national coaches including national team, Usports, CEGEP, CJFL and community/high school coaches. How do I sign up for an ID Camp? There is a different registration form for each identification camp across the country. The registration links for each camp are listed below!